EREC has sent line crews to our sister cooperative Gulf Coast Electric Co-op in Wewahitchka, Florida. Gulf Coast EC’s entire power system is down following Hurricane Michael. Both Gulf Coast EC and EREC are part of the PowerSouth Energy Cooperative family headquartered in Andalusia, AL. EREC will assist Gulf Coast with power restoration after Hurricane Michael’s devastation. EREC has also sent supplies such as bunk trailers, cots and ice to assist Gulf Coast EC as the rebuilding of their communities gets underway. Our hearts go out to our many fellow cooperatives who were severely damaged after this historic storm. 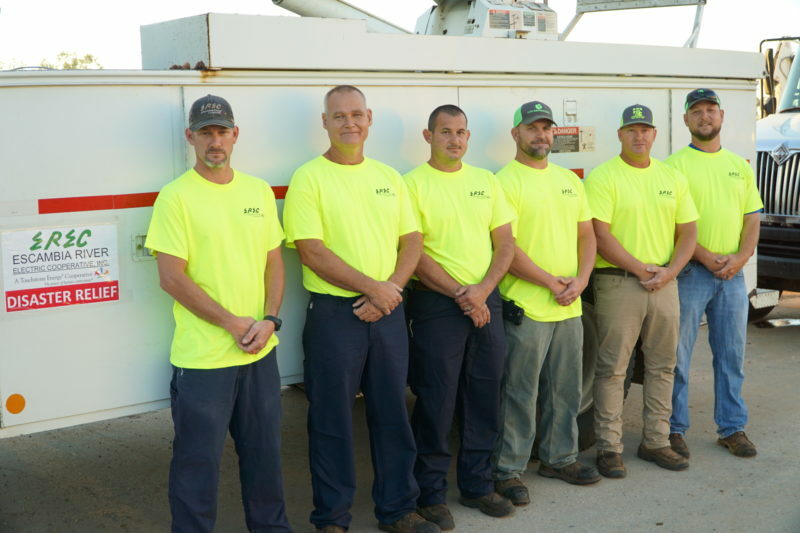 Kevin Macht, Ken Blair, Mark LeFlore, Doug Stewart, David Deese and Matthew Reynolds will work with other linemen in Wewahitchka, Florida, assisting Gulf Coast Electric Cooperative after Hurricane Michael.